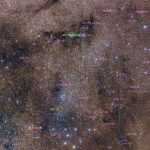 Sadr (Gamma Cygni) sits at the centre of the large asterism known commonly as the Northern Cross that makes up the constellation of Cygnus. 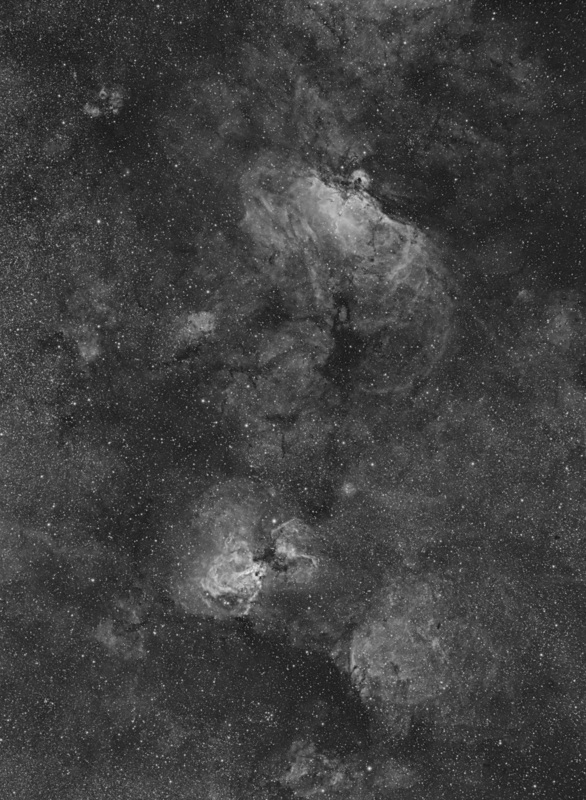 The region surrounding this F8 supergiant is rich in dust and hydrogen within the plane of our Milky Way as this view, taken in the light of hydrogen alpha (at 656.3nm) shows. 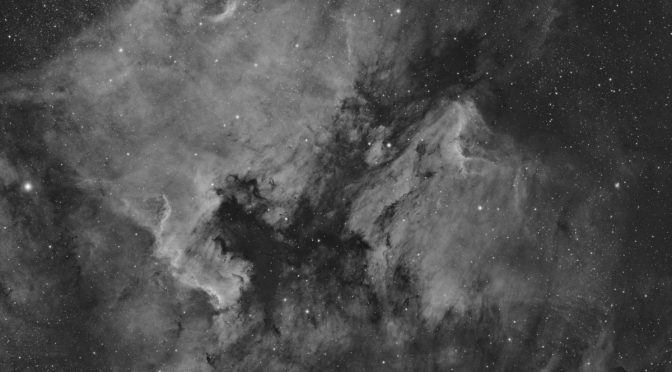 Notably, just to the east (left) of Sadr, is the Butterfly Nebula, IC1318. This actually sits much further away from us than Sadr at ~5000 light years (Sadr is about 750 ly distant). The nebula appears split into two by a dark dust lane running E-W, catalogued as LDN 889. In the lower right of the image is the Crescent Nebula, NGC6888, powered by the Wolf-Rayet star HD 192163, while to just to its east, and only faintly visible is the small planetary nebula, PN G75.5+1.7, also known as the Soap Bubble – though really a bigger scale and [OIII] filter data would make this much more obvious! Image taken on 17th Sept 2018 from West Oxfordshire. QHY163M (-15C, gain/offset=200/85), Canon 200mm 2.8L II (@f3.85), Baader 7nm HA filter, Losmandy GM8 with Gemini 1. 3h40m total exposure (5min subs) with HDR Composition for bright stars (25x30sec). 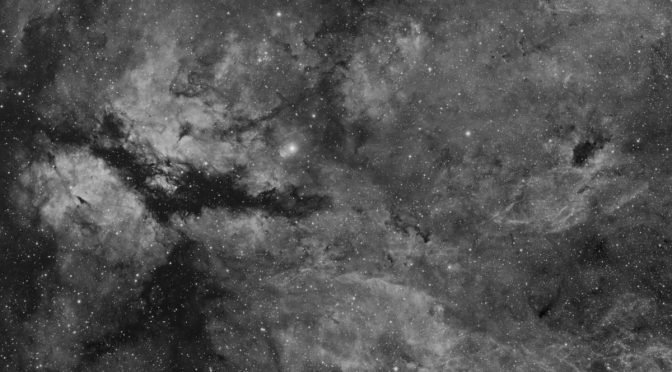 The plane of the Milky Way is littered with areas of star formation; regions of the sky that glow in the light of hydrogen alpha, emitted by large clouds of excited hydrogen. Two such areas are the Eagle Nebula (M16), and the Swan or Omega Nebula (M17) as shown (north is approximately up in this image). Both nebulae are regions of recent and ongoing star formation – and both have associated open clusters containing young, hot, luminous stars whose radiation helps to excite and illuminate the nebulae themselves. M16 is thought to lie at a distance of approximately 7000 light years, with M17 between 5000 and 6000 light years. Also shown is the open cluster M18. Image was taken from Domaine des Mathevies, Sainte-Nathalène, Nouvelle-Aquitaine, France on 14/15/16th Aug 2018. This is a region of sky that I can’t really image from home: the southerly declination means that it’s never particularly high above the horizon from Oxfordshire, and this pairing never makes it above the roofline of our house from my home observatory! 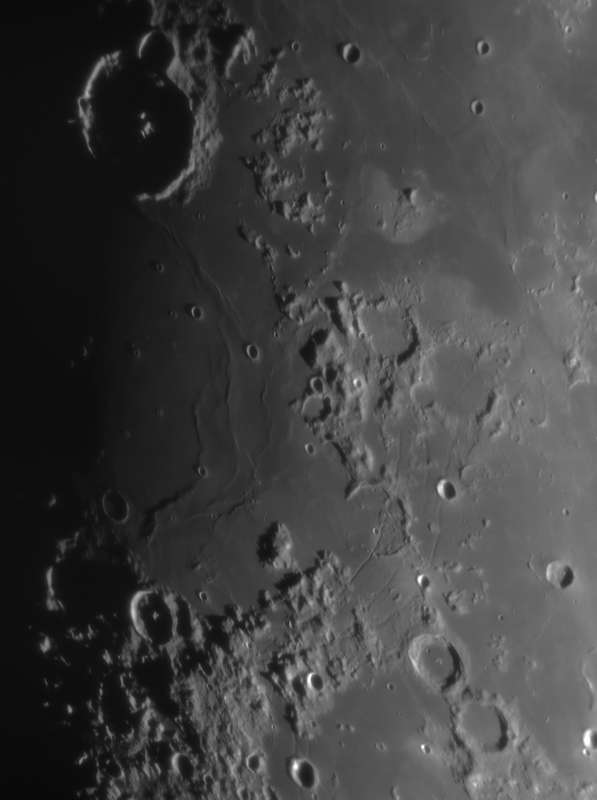 Image taken using a QHY163M at -15C (gain/offset 200/85), Canon 200mm f2.8L II lens with a Baader 7nm H-Alpha filter. Tracked on a Losmandy GM8. 2h50m total exposure (in 5min sub frames). Within the constellation of Vulpecula is an asterism catalogued as Collinder 399 (Cr 399, from a catalogue of open clusters published by Swedish astronomer Per Collinder). 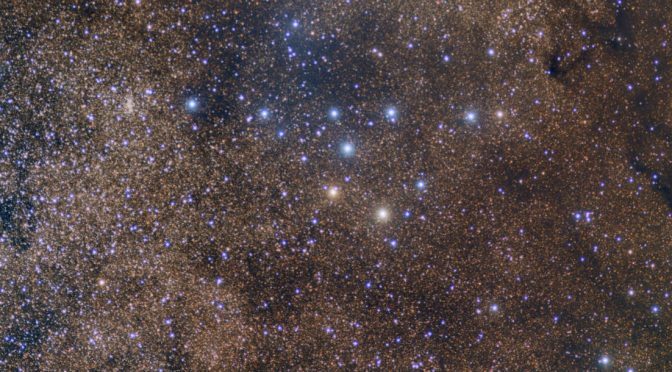 More commonly, this asterism is called the Coathanger, owing to its appearance Brocchi’s Cluster, or Al Sufi’s Cluster. Despite being considered as a true open cluster for much of the 20th century, this is in fact a random grouping of stars – data on parallaxes and proper motions from Hipparcos (http://articles.adsabs.harvard.edu/full/1998A%26A…340..402B) shows these stars to be a chance alignment rather than any kind of bound cluster. To the north (and partly encompassing the Coathanger itself) is a reflection nebula with designation LBN130, while further to the north, located with a background of a larger dark nebula (LDN 767) are another two patches of reflection nebula VdB126/LBN134 and LBN 133. 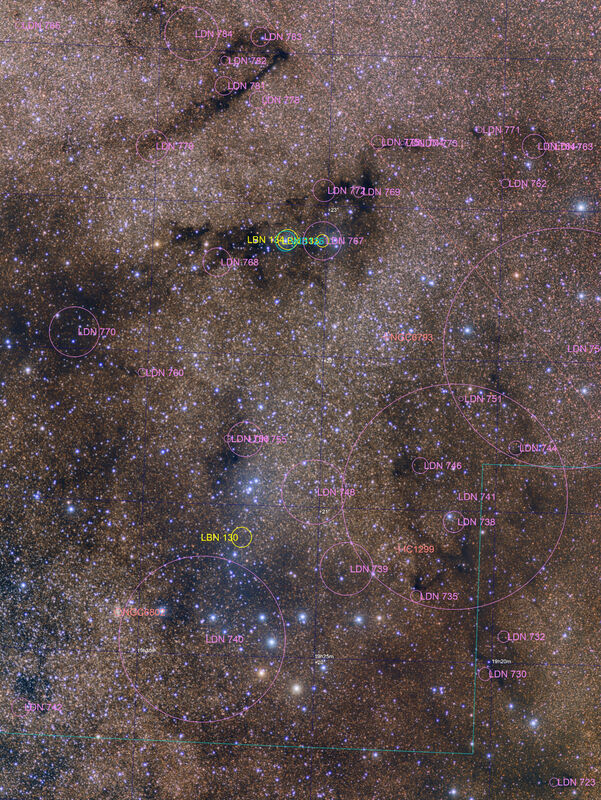 Surrounding the whole area are many members of the LDN (Lynds Catalog of Dark Nebulae) catalogue that block the light from the myriad background stars in the plane of the milky way – these are marked in the associated annotated image. Image was taken from Sainte-Nathalène, Perigord, France on evenings of 10th/11th Aug 2018. Camera was QHY163M running at -15C on a Canon 200mm f2.8/L II lens (@f3.85). 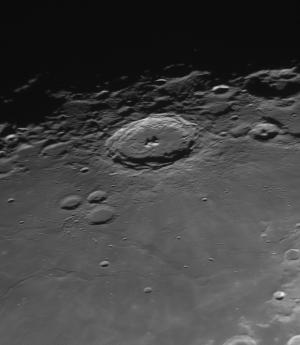 Mount was a Losmandy GM8, guided with a 160mm guidescope and ZWO ASI120MM. Exposure was LRGB using Baader 36mm LRGB filters. Exposures were L=166 (1min sub-exposures); RGB=98:90:88 (2min subs) – totalling 7h22m. All taken at gain 75, offset 27. Image capture using Sequence Generator Pro; processing using Pixinsight. This image was published in the Gallery section of Astronomy Now, October 2018. 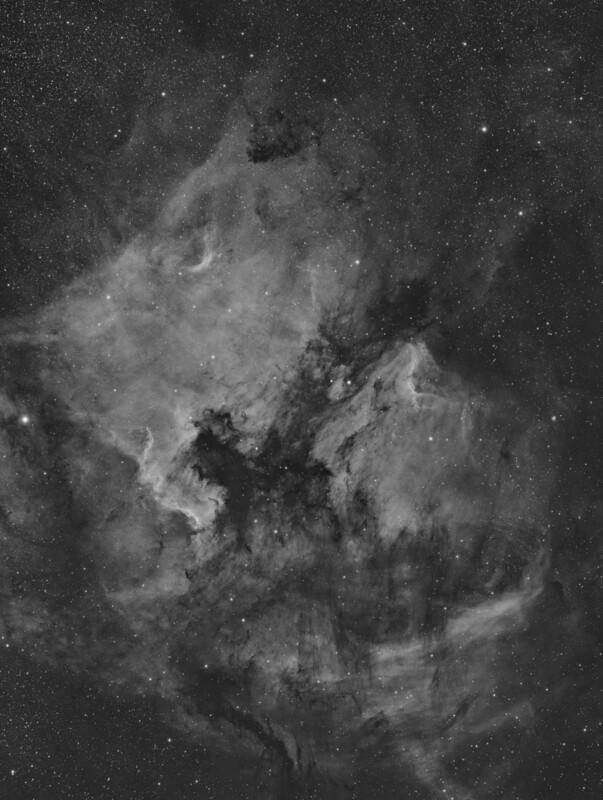 The North America nebula is a remarkably shaped area of emission nebula in the constellation of Cyngus, just to the west of the blue-white supergiant Deneb (α Cyg – just out of shot to the right) – it’s name coming from the clear resemblance to the continent – even down to the gulf of Mexico. 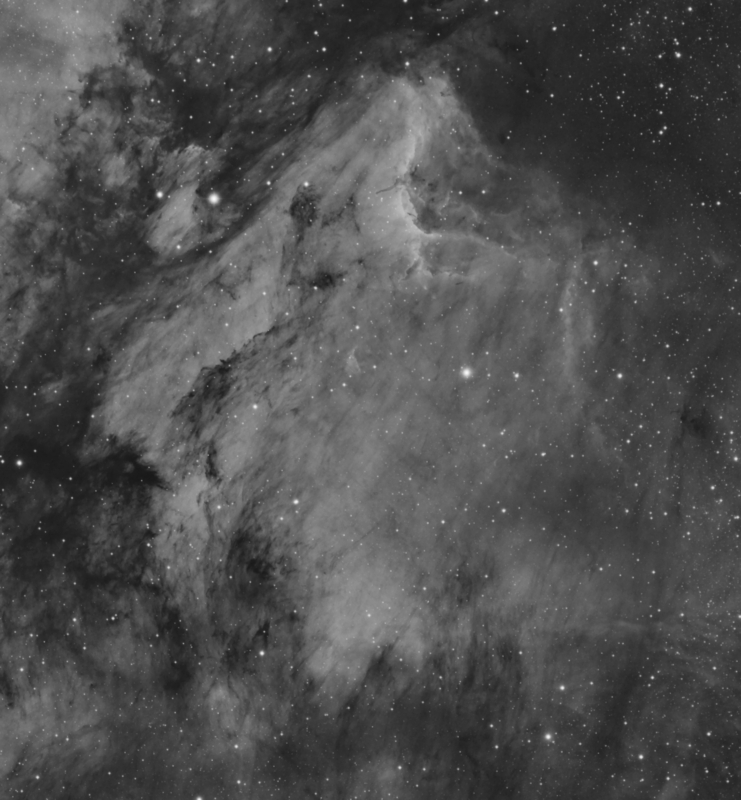 It is accompanied by the Pelican Nebula (IC5070), another emission region located between NGC7000 and Deneb. 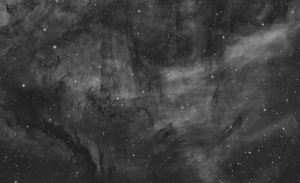 The whole nebula is formed out of one cloud of gas, with a dark band of dust between the two blocking light from behind and giving the resultant shapes. 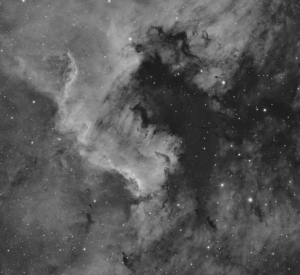 There are several areas of star formation in the nebulae – particularly along the region known as “The Wall” in NGC7000, and in the Pelican (and just visible on this image) a Herbig-Haro object (HH555) which shows two jets associated with a newly born star. 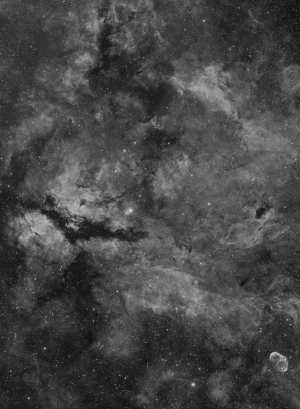 This can been seen in the 100% scale close up of IC5070, just to the right of the “eye” – the Herbig Haro object is at the end of the dark dust protrusion. Just to the south of both the larger areas of nebulosity is a fainter region of gas which has a really interesting pattern of overlaid dust which forms streaks of darkness across the bright nebula, almost appearing to cross at right angles. 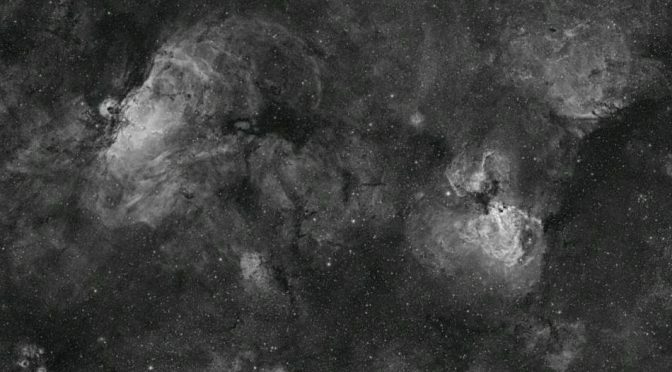 There are no definitive distances for this region of nebulosity on the sky, though if the gas is largely excited by Deneb, it would place the region at around 1600 light years distant with a size of about 100 light years. From earth, the total field of view is over 10 full moons across on the longest side. 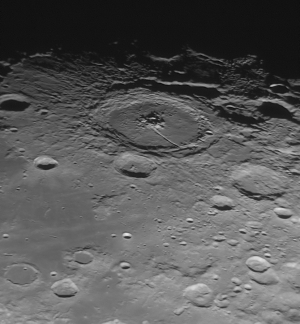 The image was taken using a new camera and lens combination – a QHY163M camera at -15C with a Canon 200mm f2.8L II lens (stepped down to f3.85 with a 52mm step ring). Mount was a Losmandy GM8, and total 5h56m in 2min sub exposures through a Baader 7nm H-Alpha filter. The camera was run at gain 200, offset 104, and all image capture used Sequence Generator Pro. 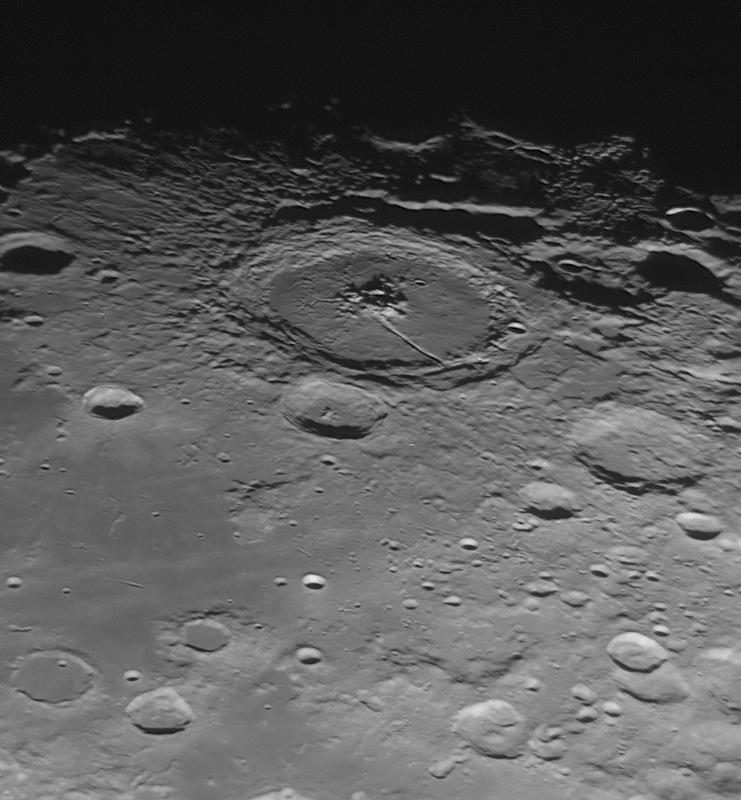 Images were processed using Pixinsight. 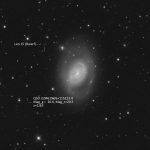 Data captured between 3rd and 8th Aug 2018 from Cassagnabère-Tournas, France. 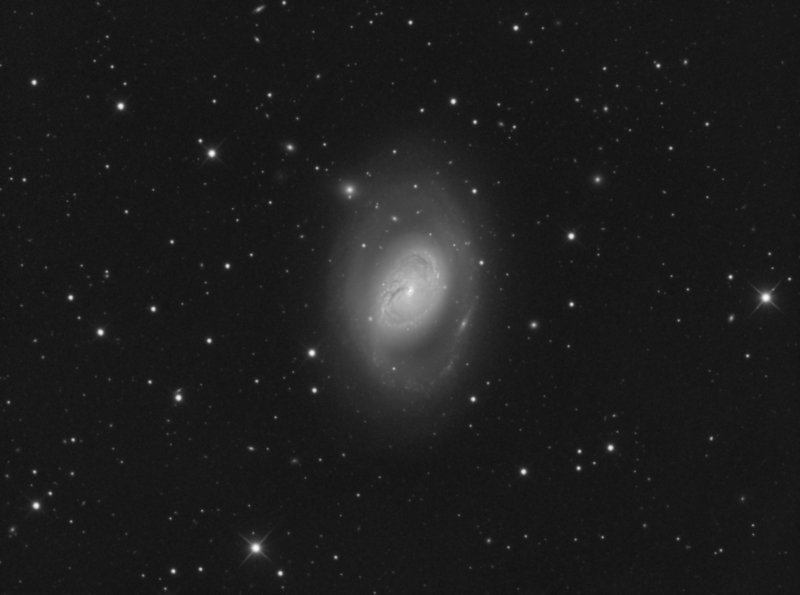 Messier 96 is an imperfect, intermediate spiral galaxy in the constellation of Leo, at a distance of approximately 30 million light years. It is a highly asymmetric galaxy – the gas and dust is not evenly spread through its spiral arms, and the core doesn’t appear to be exactly at the galaxy’s centre. 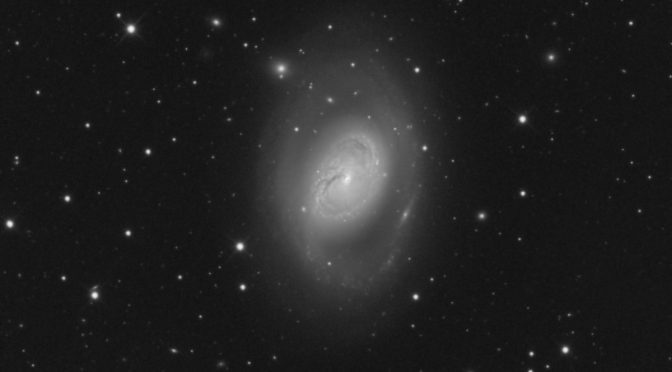 This is thought to have arisen due to interactions with other nearby galaxies (eg M95 which is about 40′ to the west of M96 from our viewpoint). The spiral arms show bright knots of young hot stars (more easily visible in colour images) indicating recent starbirth, and visible through the outer dusty reaches are many background galaxies including the edge on galaxy 2MFGC 8391 shown here to the lower right (north-east) of the centre of M96. Also in this image is my current distance record (though not something I’ve tried to push!) – QSO J104619.26+115223.4 is present (and annotated in the image shown) – this quasar has a measured redshift of z=2.83, placing it at a distance of of 11.4 billion light years (light travel time) in our current best estimates of the universe’s parameters. This quasar shines dimly at a magnitude of 20.5 in the R band. Somewhat closer to home, but equally faint, is the dwarf galaxy Leo 15 (also annotated). 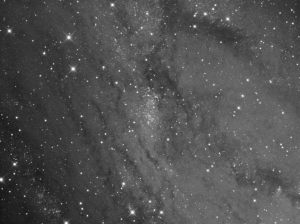 The image was taken on 22 Feb 2018 and 13-14 March 2018 and consists of 7hrs of exposure through the luminance filter (84 x 5min subexposures) using an ST2000XM on a 350mm Newtonian at 1584mm focal length. Processing and reduction took place in Pixinsight.